A lovely garden party. 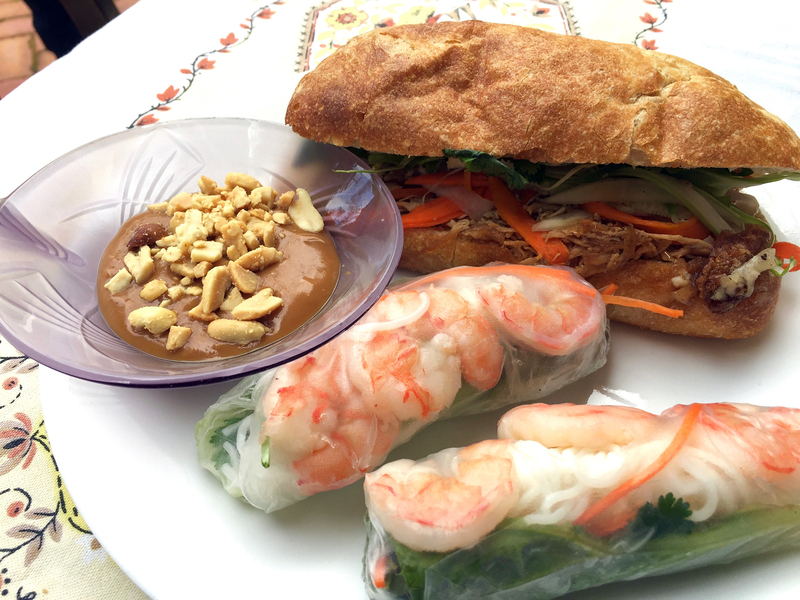 Inviting platters of delicate shrimp rolls and crusty banh mi sandwiches. Groups of people in lively conversations, getting to know each other. 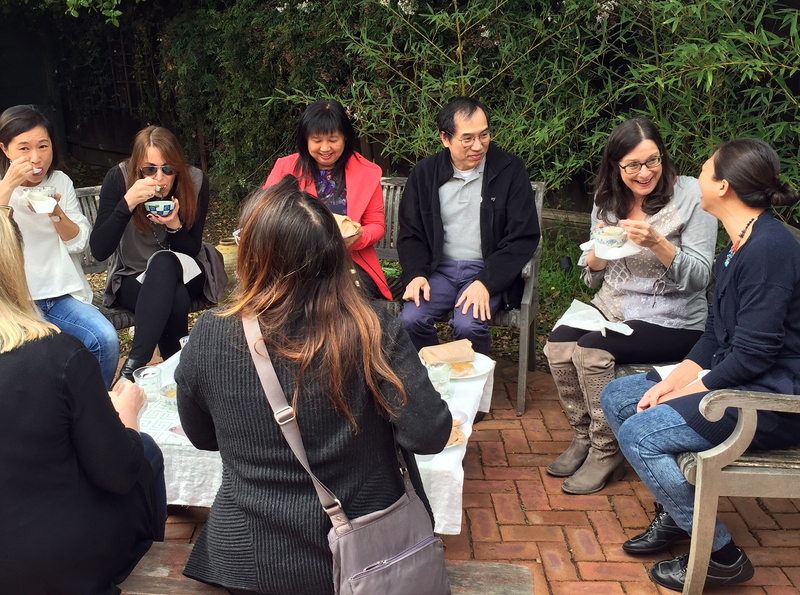 But there is another powerful thread running through this recent South Bay get-together, brought into focus as hostess Thoa van Seventer shares her story of leaving Vietnam and suddenly chokes up with emotion. When American troops pulled out of Vietnam in 1975, Thoa was 17 years old. Six years later, her father succumbed to despair and passed away. Thoa, her mother and sisters remained in Saigon under Viet Cong rule until 1985 when the former French Ambassador to Vietnam sponsored her family for French residency. But at that point, Thoa had a hard choice to make since she had just received a marriage proposal from a chief military officer's son in Vietnam. 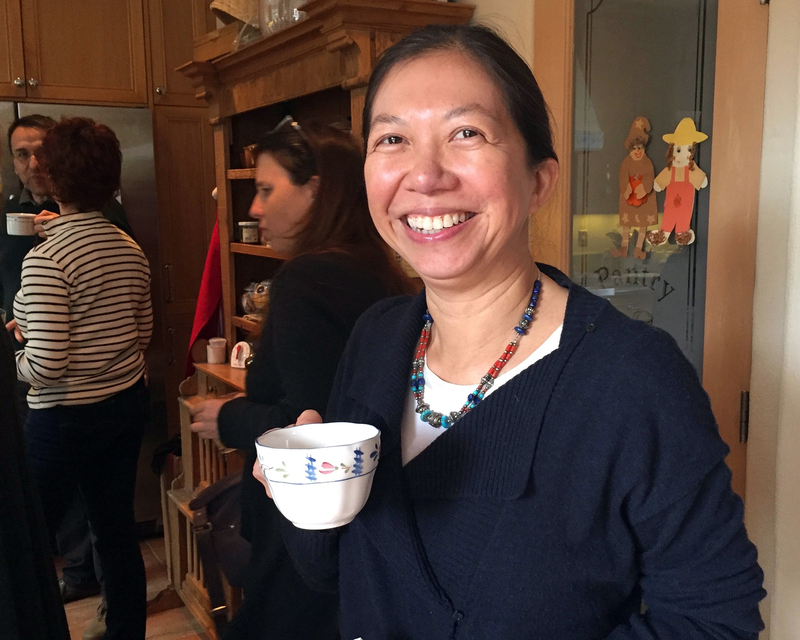 “When I see pictures of the refugees now,” she adds, “I feel respect for the refugees and for the people who help them.” And with that, Thoa serves a tray of flavorful crab and asparagus soup to her guests. This moving encounter is from the first in a series of “Tapestry Suppers” organized by Danielle Tsi, a freelance photographer and owner of the blog Beyond the Plate. Her goal is to get people together to share their experiences and break down barriers by showcasing immigrant stories and cuisines. 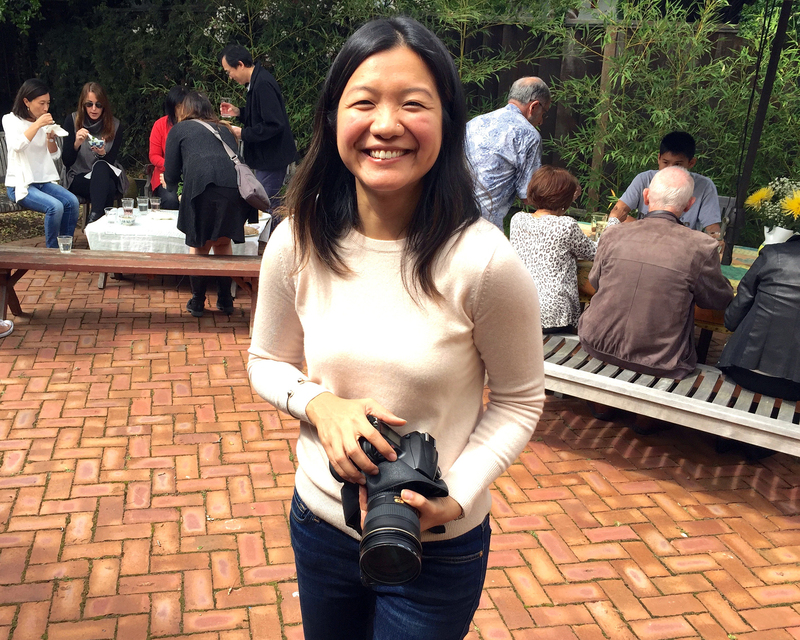 “I want to bring people together to connect offline, instead of just getting sucked into the digital black hole of news,” says Tsi, who emigrated from Singapore ten years ago. Tsi combined the ideas of people sharing food, learning about immigrants and raising money for good causes. Each get-together features a different immigrant home chef and raise money for a cause of their choice. (This one raised $350 for The International Rescue Committee.) Her idea seems to resonate in these unsettled times. The first event sold out in four days, which may partly be due to the fact that Thoa van Seventer is a beloved yoga instructor. Many of the 30 guests who gathered at her home in Palo Alto were her students and fellow yogis, including Danielle Tsi. While Thoa’s oldest sister left Viet Nam two years after the communists took over in 1975, she, her younger sisters and mother did not get out until ten years later. In the intervening years, her mother advised: “you better learn something” and arranged for her daughters to take cooking lessons. The guests at the Tapestry Supper lunch enjoyed the benefits of her mother’s forethought. The dishes Thoa prepared were familiar, but the execution exquisite. They drew high praise from the other Vietnamese guests. The rice paper on the delicate shrimp rolls was perfectly tender, the filling held a surprise bite of fresh pineapple. 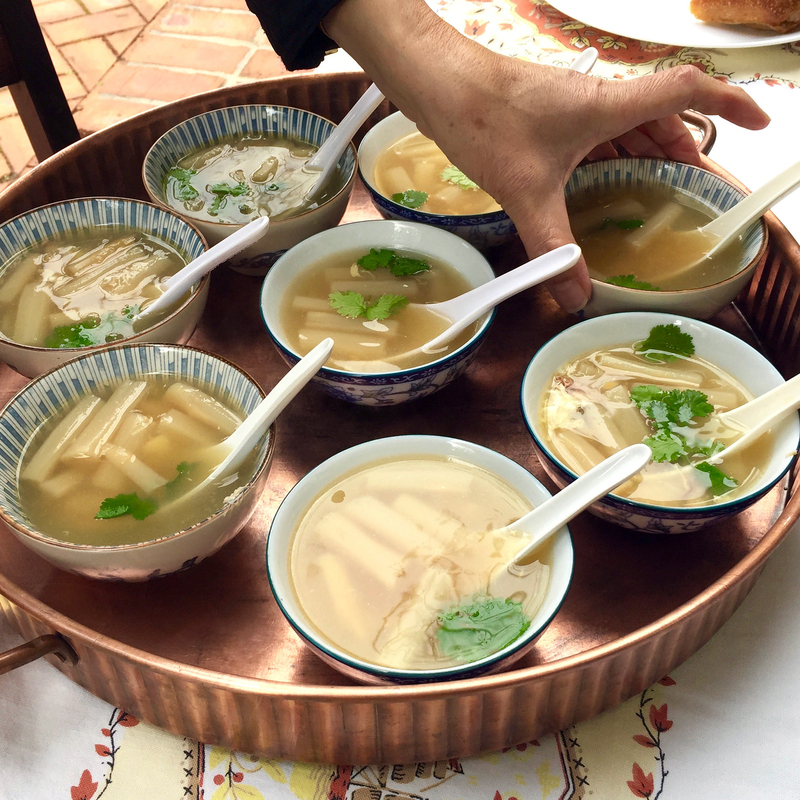 The varied ingredients in the banh mi sandwich combined in harmony, and the crab and asparagus soup, a traditional dish for weddings, was sublime. Thoa confides that she is puzzled and saddened by a friend of hers, who is also Vietnamese, but has a completely different attitude to the refugees who are desperately trying to escape persecution right now. The friend states she doesn’t want them here in the U.S. “She says that we should just take care of ourselves and our country and keep everything we can,” Thoa reports. She is dumbstruck by this lack of empathy, knowing full well that the refugees are not coming by choice, but face a stark choice: leave or die. One of the guests, Anh Hodges, shared with her tablemates her own harrowing story of numerous thwarted attempts to escape Vietnam throughout her childhood. In 1978, four brothers and one sister in her family of 11 children did escape to avoid the Cambodian draft. But when Anh and her other sisters repeatedly tried to leave they were often caught, sometimes beaten, or sent to prison for several months. Her mother would pay money to men who were supposed to help them escape by boat, but took advantage of them and just kept their money. The family would not give up. After 13 failed attempts, in 1989, they finally made it out by plane. Sponsored by one of her older brothers, Anh stayed in Los Angeles for a year and then came up north. In Vietnam, she had been a high school teacher of English and math. She wanted to continue her studies, but there was no money for that. So she attended beauty school instead, became a hairstylist and eventually owned her own salon in San Jose for 20 years, with 20 employees. A friend at the table tells of Ahn’s contributions: donating the produce from her organic garden to a local school; her volunteering at the local hospital; and other good deeds. 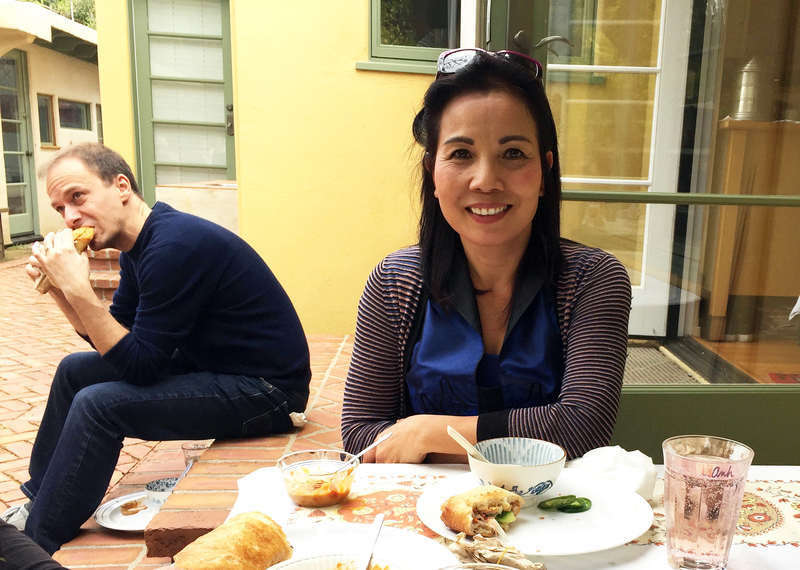 After many years working in high tech, Chou got more involved with Ashtanga yoga and Vipassana mediation, became vegan, switched gears and attended Bauman College’s Natural Chef training program. 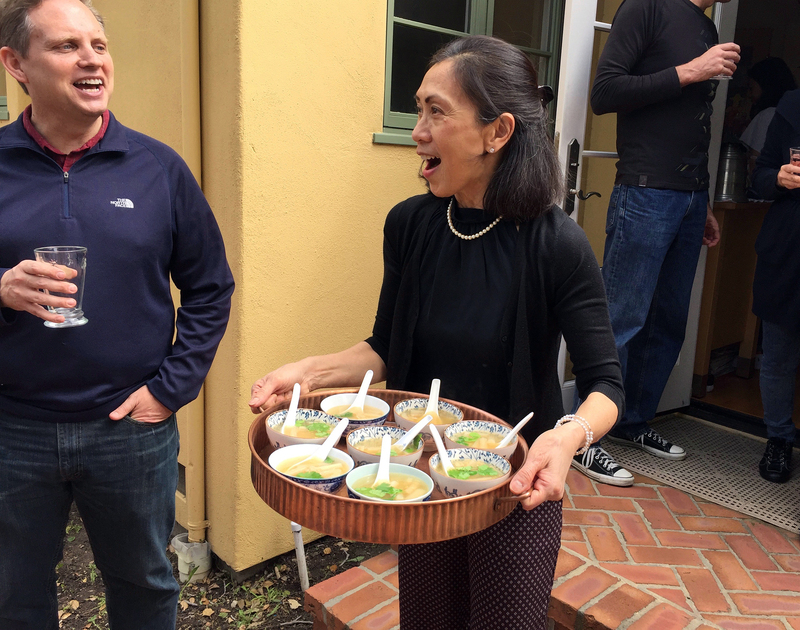 She is still finalizing the menu for April 23, and says she will probably make crudités and dips, tea leaf salad, coconut rice, and chicken/vegetable curry. The next Tapestry Supper will be held in Sunnyvale on April 23. Tickets will be available for purchase starting Monday April 10 at 9am. Monthly dinners will follow through the summer, with different chefs. May's dinner will be an Iranian meal and Tsi is exploring possibility of featuring Tanzanian, Indian and Syrian cuisines. She does not yet have a website and advises that the best way to stay informed about future events is to sign up for her newsletter and mailing list. 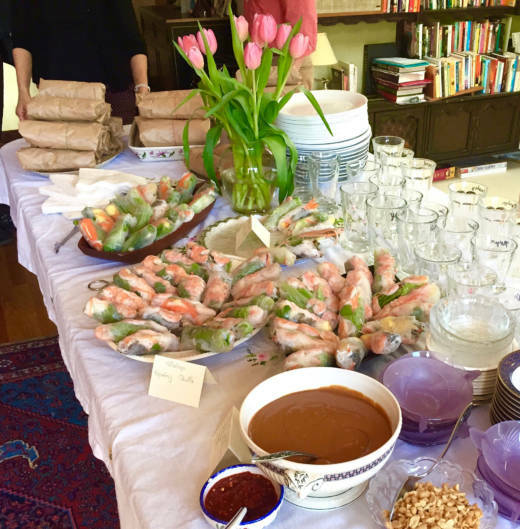 As Tsi states on her blog "At a time of strong anti-immigrant sentiment in the U.S., our gatherings are the antidote to this zeitgeist by bringing people around the table to share a meal and learn about the multitude of cultures that make the Bay Area such a vibrant place to live. We believe that a society is made stronger by the diversity of its parts, and that the best way to learn about cultures foreign to us is through their cuisine."